On beyond Win10 version 1703 – Is 1803 ready yet? Really? Home › Forums › AskWoody blog › On beyond Win10 version 1703 – Is 1803 ready yet? Really? EP 5 months, 1 week ago. I am supporting two Win10 Pro machines (not by choice), Both are year-old (so recent processors) HPs, a desktop and a laptop. The desktop is used for a one-computer business, the office of my TownHouse Assn, the laptop is the manager’s personal computer. Within the last month, I moved both from 1703 to 1709 – glad I stopped there. Reason? 1803 has had problems with QuickBooks several times now. That would have caused havoc for the business machine. Then, the recent CU caused BSODs on HP computers for v1803 and 1809. That would possibly have affected both computers. I will move both to 1803 soon. Yes, it will have meant two upgrades back to back. But somehow I’d rather that than the disruptions I would/could have experienced by skipping 1709 and moving directly to 1803. Listening to the reasoning in this thread about the possibility that 1809 may be more stable as a result of the first release notoriety, I may hold off a little longer on the 1803 upgrade and go directly to 1809. We’ll see what the tea leaves say (that’s about as good as listening to what Microsoft says). It will be back to back upgrades anyway. A proven track record for over 6 months shouts v1803 for a production environment, not assumptions of expectancy on a feature upgrade release, insider or not. W10 history has shown that insiders don’t test everything for the REAL world use. This, however, is totally dependent on the overall popularity of the programs used in the target PC. For anyone currently running 1709 I’d say that at least a brief “wait and see” period would be well worth the wait involved. At least if 1809’s re-release proves itself okay, it lets the user delay any future similar decisions for a while longer. What problems with Quickbooks came with 1803? The reason I ask is that my girlfriend is asking me about putting W10 on her W7 Pro computer and she has Quicken 2014 and uses it daily. Would she have to get the newest version of Quicken? Search this site – there were at least two blog topics on the problems b/c (IIRC) it happened twice. Also look on the Intuit site as they were working on it too. Quicken and Quickbooks are separate products. In fact, Quicken was spun off to a separate company, and is no longer owned by Intuit. I have not heard of problems with Quicken, only Quickbooks. It is a dilemma, I sort of am of the opinion that there is some benefit to not skipping a release. This goes back to my days running Linux desktops in which it seemed more stable to upgrade in sequence. Myself since I backup up personal files in cloud or external drive, I typically do a clean install of the next release. Also its nice to check to see if the PC maker has tested the release on your model. This at least gives a added measure of confidence that hardware will work properly. Still on the fence with Chromebooks BTW especially since market share OS wise isn’t even at 1%. I worry someday Google will just abandon Chrome OS altogether. HP and Quickbooks aside (I dont have or use), I upgraded my 6 month old system from 1709 to 1803 on October 1st. It was my first Windows 10 upgrade and have to say it went very smooth. All my settings were retained, and per PK since I disconnected from the internet before reboot, I never received the MS stuff like Candy Crush or any other MS stuff I previously deleted. So far – So good! And its good till EOS November 12, 2019. I moved up to 1709 on a desktop and two surface pro 3/4 a couple of months ago. I have had no substantive issues. I don’t really like skipping versions as a general rule as I would prefer to deal with any upgrade related problems incrementally and learn from that process. Skipping a version in between might be a step too far too fast for me – luckily thus far not too many whiz-bang new features to contend with, just removals and augmentations. I still use an old Windows Home Server that is far outside its service dates so have no access to SMB 2/3 protocols for that OS. I use the little workhorse as a media server primarily and I need to retain SMB 1 functionality within windows 10 and my network – I know the risks but I’m not concerned. I stop updating Windows when SMB 1 gets dropped. At least until the Home Sever dies. I can suggest that most v1703 users should be fine when upgrading to 1709 but have no experience with anything in the 18XX series. I was on 1703 and took the leap to 1803. I did my secondary pc first (Intel i5 4440, Gigabyte H97N-WIFI) and run through all the tasks I do on it. after 2 weeks I found two issues. VLC lossing the audio settings. Once I reset them, VLC worked with no further issues. Configuration of 1 of my backup scheduled tasks was corrupted. For that I had to re-create it. 1 Hyper-VM lossing vDisk config. Once config reset, VM worked with no issues. WinRM host settings were lost and I had to reconfig it. I did the upgrade 90 days ago and no further issues have been encountered. And considering how unbelievably low Microsoft’s standards seem to be (assuming standards exist these days) that ‘s an incredibly painful indictment of Windows 10 1809 as a product and of Microsoft’s development methods! I’ll risk a suggestion that may be at odds with all others in suggesting that you move straight to W10.1809 when it’s made available again. I strongly suspect that, having suffered considerable embarrassment due to a very bad start, MS will be focussing its primary efforts on avoiding any further issues with that version. I’ve been running it on a test machine since its initial offering and, even without patches other than kb4465477 and kb4464330, it has been quite stable and trouble-free so far. There is that residual compressed file extraction issue, of course, but I’ve always used 7-Zip rather than Windows built-in functions anyhow. That may, in fact, be the best course – but I can’t wait for 1809 to appear, then add a couple of months for any big bugs to sort out. I, too, have high hopes for 1809. But unless MS extends support for 1703 (or I’m willing to run an unpatched machine for a few months, which isn’t in the cards), I have to jump now. Understood. I guess I was just suggesting that W10.1809 shouldn’t be dismissed entirely due only to its bad debut. It may turn out to offer the best solution even within a relatively narrow timeframe. So, Woody, have you pulled the trigger and made your jump to a newer version yet? If so, which version did you choose? Sorry if you’ve already said and I missed it. I’m still sittin’ here on 1607 and need to move on, also. I thought I’d follow your lead on this one, since the problems with every version so far make it impossible for me to risk going through the trauma again that going to 1607 caused upgrading four computers; three for me and one for a family member. I’m just getting too old! 🙁 Thank you very much. Lots of folks are still on Win10 version 1703. Less than 1.9%, as more than 95% have already moved on. Fixed last week with Windows 10 October 2018 Update Build 17763.107 (KB4464455). Yes, but apparently “fixed” for “Insiders” only. As stated, my comment was based on running Microsoft’s initial W10.1809 offering with only the SSU and LCU patches that I mentioned. That brings my own test installation to build 17763.55, not an interim “Insider” release. @b and@arvy are both correct. As long as you are basing it on usage percentage, I’d suggest Windows 7 SP1 since it has a larger percentage of users than ANY version of Win 10! Are you again looking at AdDuplex “statistics”? I’ve migrated 8 Windows 7 Pro and 3 Windows 10 Pro 1703 PC’s to 1803 in the last month. 4 of those were running Quickbooks 2018 Multi-User. One of the Win 7’s is running Quickbooks 2012 and another a HP Z420 Xeon E5-1650. All SMB’s running standard commercial apps plus a few company specific apps. Overall I’m astonished at how well the upgrades have gone. I fully expected to have to upgrade the Quickbooks 2012 but didn’t. I had no trouble with Quickbooks 2018. I expected to have trouble with the Z420 XEON but didn’t. Almost all of these PC’s were running Norton Internet Security. I disabled it on the first one and ended up having to remove it and reinstall later. Afterwards I uninstalled on all of them before starting. After reinstalling NIS it takes a little while while NIS and Windows Defender battle for supremacy. On some of the Win 7 PC’s I would get an error “Setup has failed to verify the product key” after starting setup. I found a simple workaround for that. One of the Win 7 PC’s had a RAID 1 array for data backup. After the upgrade was complete the RAID array was split into 2 separate drives. The network shares that had been attached to that array ended up being assigned to the boot drive which quickly started filling up from the network backups that were running. This was all quite a surprise. I had a lot of trouble with workgroup file sharing, being unable to network browse or connect to other PC’s in that workgroup. I finally disabled IPv6 on all PC’s within the workgroup and those problems went away. If you count on IPv6 I’d be very careful. Several legacy printers failed to migrate from Win 7 but no surprise there. All had new drivers available on their websites. Prior to upgrading each PC I had ran a full image backup of the boot drive using Paragon. Fortunately I didn’t need it. I created an thumb drive using the Media Creation Tool and then copied the files into a temp directory on the machine to be upgraded, that sped things up quite a bit, not having to upgrade via the thumb drive. I had also had downloaded the 1803 updates through September and manually installed them after the upgrade was complete. All systems were set to 365/30 Semi-Annual (NOT Targeted). Overall it was a pretty painless exercise. It took 4-5 hours per Win 7 PC to get back into production with a few other minimal problems. The 1703 to 1803 upgrades took about 2 hours each. I use Open Shell to disguise the start button which helped most of the users. I have one more Win 7 RAID Xeon PC do to so I’ll split the arrays before upgrading. From what I’ve seen, I would not hesitate to go to 1803 unless you need IPv6 in a workgroup setting. I have been on 1709 since last November. Skipped right over 1703 and 1803 as I can’t be bothered with Microsoft’s idea of an update cadence. Once a year is enough for me. 1709 has been rock solid. 1. 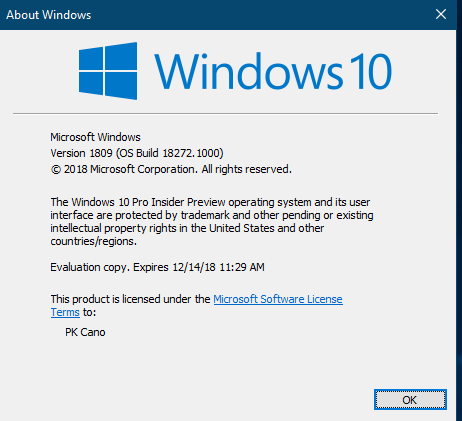 After the October 2018 debacle – I am sensing that 1809 just may be the most “checked” version of Win 10 to date and when finally re-released – it should be solid. 2. v1809 Enterprise allows 30 months of support – meaning I can skip over several versions without having to tear everything down each year. I just built a new computer in early Sept. (AMD 2700x) and started with a MCT of 1709 which ran fine and I just got 1803 on Oct. 31 (a halloween surprise) but all went smoothly and it seems to be working great so far (unless MS decides to do a nasty update). I did all the settings to keep 1803 off of the new machine until I saw Susan’s Master Patch list about 1803 running fine for her so I took all the safeguards off and let it roll before 1809 hit again. 1803 kept all my settings etc. and did not re-install Candy Crush etc. even though I was still hooked up to the internet during the process. I have an HP ProBook laptop that is still on 1709 and will probably let it update to 1803 soon. I went from 1703 to 1803 and right away got the message that my wife’s Print Shop has to be reinstalled because it may not work correctly. That was alright, as I’ve had to reinstall it every upgrade since 1511 with no problems. Although this time, and I’m assuming it’s because of the registry changes in 1803, it would not let me uninstall without errors. I did reinstall it over the previous install and it’s working, but not without several bugs. I honestly think that M$ should be held liable and have to pay for broken software caused by there idiotic having to update every time you turn around. I have had to throw away or give to Goodwill, boxes of broken software. The time spent and the money wasted is absolutely absurd. I am the family IT help desk and computer administrator, so maintaining any and all computer devices (as well as also most electronic devices) falls to me. My main system AMD Ryzen 1700x/AsRock TaiChi has been on 1703 from birth. Such as the way I like things, numerous hacks and tweaks have been employed over the course of just over a year. I also have employ a few tools to make 10 fit my way of working a lot better. Classic Shell and 7+TaskbarTweaker. Learning of the EoL status of 1703, I grabbed the downloaded .iso of 1709 and launched from the self-mount. On updating (carefully not saying upgrading there) to 1709, generally speaking it would be smooth enough for a ‘normal’ basic user. However, I am still finding many things which have been reset or mangled. 7+TaskbarTweaker had to be updated, and the author is aware that MS keep moving the goal posts as far as his program is concerned. One rather annoying issue that has come up from the update is that I cannot now find a running explorer window by it’s title just using simple cmd and tasklist. I’ve had to resort to a batch script with powershell doing the seeking. That took time to diagnose and solve. Folder preferences seem to be a bit hit and miss in what has been remembered. Some seem to have falled in audio or pictures or something else, where I had set them to general items before and made customisations. Audio device order seems to have changed around, and the device names, by which EqualiserAPO addresses them haven’t changed, but they no longer seem to accept the programs adjustment. I had to manually go though and edit config files to get that back on track. The biggest issue was my fight with ZoneAlarm. Yes, I can hear all of the muttering and murmuring. I feel that it alerts me to registry changes and other activities that I wouldn’t ordinarily be informed about. I prefer the control over MS’ own firewall. But yes, I had to remove the ZoneAlarm AV/FW program and network stack driver, and use safemode to really clean that stuff out before I could get their own cleaner tool to stop crashing! All seems well now. I appreciate that this maybe 6 of one and half-a-dozen of the other in laying blame, but still, this was a few hours I wasn’t getting back! I suppose it could be a lot worse, but I wouldn’t say it was enjoyable for someone who knows their way around registry enough to make the desired changes they need. I am not looking forward to doing it again in ~ 6 months. Still on 1511. Happily so. Naively lacking security paranoia. Productive. I could be in a hurry to update but I’m not. I enjoy listening to these conversations, and if I hear one or more compelling reasons to update I might. I’ll continue this experiment until I procure new hardware, update for compelling reasons, or get wiped out by a security breach. You all can say ‘I told you so’ in that case. Until then, happy computing. To RamRod: I’m very interested in following the progress of your intrepid “no updates/no upgrades” experiment with version 1511. I am currently conducting a similar experiment with version 1703 on a PC running Windows 10 Home edition. 1. Would you mind listing the blocking techniques you’re using that have allowed you to thus far successfully prevent forced updates and upgrades. Am I correct that you’ve made configuration changes that go beyond merely disabling the Windows Update service? 2. Also, assuming you’ve disabled the Windows Update service, are you still able to manually download and install daily malware definitions from Windows Defender Antivirus (using the Update button in the Defender interface) even though Windows 10 version 1511 itself has reached end-of-support? #224870, #217981, #216572, #198098, #188266, #181374, #177921, #163275. Nothing too inspiring – turn off Windows Update Service. Remove SIH tasks from Task Scheduler. Stay on metered connection. Never Check for Updates. I do manually download Windows Defender AV updates. Usually once per day. Sometimes longer. Not sure if my version of WD is up to date. Not sure of the exposure there. Don’t run any other AV. I have noticed that WD updates automatically on non-metered connections. Vigilance! I don’t interact with my financial institutions via computer. I don’t pay bills via computer. I check news sites, I listen to MLB-TV during baseball season. I use Excel to keep inventories of home and vehicle maintenance. I use Word to write stuff. I use Visio to design my wife’s craft room and my home office. I use Chrome. I use Everything to find files on my computer. I use IrfanView to look at pictures. I use SyncToy (the precursor to OneDrive) to synchronize my files between my computer and several external hard drives. Pretty simple stuff. I use my phone for everything else. To RamRod: Thanks for your speedy and very detailed response (post #230110, 11-04-2018). Will read your other posts that are identified by number in your 11-04-2018 reply. I find it very encouraging that you’ve managed to avoid both forced updates/upgrades as well as security breaches for so many months. I’ve made a few additional configuration tweaks in my own system that may prove useful, which I’ll describe once I’m satisfied that they’re safe and effective. I’ll be in touch. I have a bunch of clients still on 1511. Given MS’s move to the release often release early paradigm, we simply have no choice but to move the focus of security from the OS itself to perimeter defence and local (non MS) hardening solutions. Letting MS ‘have at it’ have proven more dangerous, costly, and downtime inducing than is the risk of being struck by a corner case external threat coming in via an unpatched machine …. again, assuming that local hardening and perimeter defence is in place. I have not done any work on 1803, it will simply get missed in my world. Once 1809 comes along we’ll start to do integration testing with a view to upgrading extremely old builds in about 9 months to a year (once it’s matured). 1709 is stable, and more than a year old now, it’s getting pushed out to slowly replace 1511 and 1607 machines (where that is possible). These machines will run 1709 for at least a year, at least, probably 18 to 24 months real-world. I was lazy last Feb and upgraded 1703 to 1709 like it was a service pack and not by a clean install. Subsequently it broke running every Modern/UWP app, broke the Store and broke the Desktop menu. I had to run Win32 apps from the Run box or from desktop shortcuts. I tried Classic Shell but it wasn’t consistently successful, then I tried Stardock’s Start10 (demo) and that allowed the Desktop menu to work consistently for Win32 but the Modern/UWP apps remained broken. I tried every Troubleshooter gambit recommended by Microsoft but all for nothing, so I had to bite the bullet and run a Reset for a more or less clean install which fixed the issues. Then ran the Ninite app installer but that’s just for generic software not custom apps so I’ve still not installed everything I lost. To do so is just too annoying since I expect I’ll have to do it again soon anyway, either when I “upgrade” again or after some regular updates finish breaking things. Moral: with every “upgrade” run as close to clean install as you can tolerate because the new “versions” aren’t equivalent to service packs and will likely break things. This is where discussion had to eventually lead. I have never appreciated the “18 month lifecycle” statement used to shutdown complaints. A new OS is released every six months, give or take. You can advance at the lead, advance at the rear, or play leapfrog one at a time. Under all three possibilities you are under a near constant decision matrix, instead of tending to productive endevours. LTSB (LTSC or whatever acronym is made just to be different) offers a brief respite for those that have the means to seize it. But there is a downside there as well. By the time your attention returns to “what should I do now?” much has changed. This requires hours or days of research, leading to possibly weeks of dithering over the choice. The cadence is crushing. Testing might have made this process seamless. But that is an unprovable unknown, because we cannot change the past. But really, again, the fact that we discuss this at all — demonstrates the model is broken. Before you throw in the towel on Version 1803, check with HP and see if there are driver updates. Those may make your PC able to upgrade to Version 1803 and beyond. If your hardware can’t upgrade to Version 1803, you are at the end of life for that PC. At least as a Windows machine. Linux should run just fine, for your future reference. At Version 1709, you are fine for now. But six months from now you will have to make a choice. I agree that Chromebook is a good choice for a new “PC”. Especially an Intel based Chromebook with plenty of onboard storage. This is how I manage to use Linux on my Chromebook in a dual-boot arrangement. I use Fedora 28 mostly in there, but I can use ChromeOS (Beta Channel) any time I wish. For existing Windows machines, like my Intel NUC (Skylake 6th generation), Windows 10 Pro, Version 1803 is working just fine these days. And it will not go out of service six months from now. I like having options. And I update my own drivers, never letting Windows do that job for me. I run the Intel Driver Assistant program each time Windows gets its monthly updates. (Also, definitely a must to do after any Windows 10 Feature Update.) Then I back up my drivers. Simply copying the Windows 10 Driver Store to an external location will do that job nicely these days. So if MS Update slips me a fast one on drivers, I can roll back or update directly from Intel, then back up the drivers again. Wushowhide is also our friend in these matters. This is how I am running the Windows side of my Linux-Windows dual-boot arrangement on the NUC. No Windows or Linux issues, except that I had to set Linux to use local time zones, not UTC, so as not to mess up the Windows Clock and Time Stamps. I actually prefer to set Windows to use UTC internally. Less of a hassle that way, especially with NTP time sources – and possible timezone definition changes in the future, if anyone’s been watching the EU DST debate. A customer of mine is on 1709 – 64 bit. No problems. They are a small credit union, if that means anything. Wish I could stay longer on 1709. The thing is, I will be force-upgraded in January if I don’t do it now. Big chance that by January, Micro$oft magically declared 1809 business ready. So no thanks, not going to take that risk. At the same time, I wonder if any machine here will survive yet another upgrade AKA install-over-install. Everytime this procedure gets slower and the result is more quirky then before. One thing we know for sure: any machine that fails to upgrade here will not get Windows installed anymore. Personally, I’ve had the best experience of all the Win 10 versions with v1803. It has had the best monitor support and is the first release in several versions that hasn’t become unserviceable on it’s own for me. FWIW I’ve gotten more problem reports from my (graphics software) customers with v1809 even though supposedly few folks got it. There seem to be some OpenGL driver incompatibilities when trying to use older drivers. V1803 has been the most challenging to trim down and make private. It’s also the most bloated, though I imagine v1809 will supersede it for that distinction. All in all I’d recommend updating to v1803. Seems pretty solid. Noel, I’d be interested to know what steps you took to make 1803 private as I’m seriously considering making the jump from 1709. 1803 is the safe choice here. Unless 1809 introduces a new must-have feature for you there is no reason to jump on it right away. Once 1809 is re-released it will take a few months for software developers to complete testing and release 1809-compatible versions of their applications. Most business choose to wait for this reason (and also to let others be the guinea pigs). Woody, hello from Bangkok. Until a few days ago was on Windows 10 1709 on an Asus desktop – it was a ‘forced update’ with 1709 hidden with WUSH and internet on metered connection. Inconsiderate bad manners on the part of MS not respecting the customer’s settings. A few days ago 1803 appeared as downloaded awaiting install. Then restart to finish, update didn’t want to work. Next day off it went – 1803 was also hidden and on metered connection. Download was quick I have a 1Gig download connetion with True, however the installation took hours and hours – 1803 code named ‘Snail Invasion’. Finally it was over. I spent several hours checking all the settings etc etc to ensure all was working. Apart from MS using incredibly small text (not good for oldies or those with poor sight) all was ok and working. I have to say that I neither want nor use all the bloated crapware MS have on 1803. I’m sure for their benefit, ala the NEW Windows Security, not us poor minions. Who protects us from MS?? This will be the very last MS update I will endure. Enough. It took a good day to get it done. Windows as a Service is one of the great oxy morons. From here on I will look for the remedy to W10. Be that Google, Apple or Linux I don’t really mind just so long as I don’t have to suffer the twice yearly forced MS updates. Woody in your shoes I would take select the most currently available and secure versionof W10 with the longest life before update. Your opinion may vary. Thanks to you and those who keep the good information coming. I also experienced an incredible slow upgrade from 1709 to 1803 1.5 week ago. On a recent laptop (quad core i7) with basically only Office 365, Lightroom, PSP and some basic tools (winrar, Thunderbird, Firefox) installed. Had to uninstall a virusscanner first, on advice of – in this case – Kaspersky. All in all, the upgrade took over 3 hours. No idea what it was doing, very high continuous disk activity. The download itself was done in some minutes, so it wasn’t that. Reinstalling the security suite, checking all my user settings again (many were ‘kindly’ changed by Microsoft of course) etc took in total about 9 hours. Like that, I can’t work anymore. Complete nonsense in my opinion. We are going to downscale Windows computers here, those became unmanagable and untamable. Because this was only the first computer of 4 🙁 For smaller companies, Windows 10 is an absolute disaster. How sad that we can’t even enjoy the support of an stable version of windows, since Microsoft never works on stability, they believe features are more important. If you REALLY think about all this, it’s just plain ridiculous. Serious Win 10 users all over the world are pulling their hair out to stop upgrading, debate for hours which upgrade should be installed (because something MUST be done) etc. Every upgrade makes a system potentially less stable. Added to that, often a new installation instead of upgrading turns out to be quicker. More and more people are begging Microsoft to stop this tirade of upgrades, but they don’t listen at all. Is it me or is there something fundamentally wrong here? You don’t need to update if you are happy with your machine for now. Use an imaging tool and backups for data, as well as security apps if desired, so the patches aren’t needed. Malware is relatively rare if you are careful. Updates are for the lowest common denominator, which you aren’t if you are here. I am happy with a number of small conveniences available on 1803 that are not included in 1703 or 1709. Example: the Windows Defender badge indicates everything is hunky-dory, even though the definition file might be several days, maybe a week out of date. With 1703, updating the definition file was buried under several layers of dialog through the Windows settings menu. Much more conveniently, 1803 allows update of the definition file with a right-click of the Windows Defender badge from the desktop. Despite the new “bells and whistles” features, 1803 is more functional and has more polish in handling everyday tasks than 1709. There is no version of Windows 10 that I would apply the word “Stable” to, but 1709 seems to be the closest though it has some rather annoying bugs that have been around since the first release of Windows 10, such as the inability to wake from sleep without bricking explorer. I have rolled out Windows 10 1709 to 10 PCs here with extreme customization’s to try and make it useful and safer (“Safe” is another word that should never be used in the same sentence as Windows 10… Or Microsoft). I’ve tried several times to test 1803 but it’s still full of holes, and the new acrylic… yuk! I was hoping to test, customize and roll out Windows 10 1809 to PCs over January but it looks like that won’t be happening. Even if Microsoft re-release it soon, and they’ve ironed out the major bugs, there are still lots of less serious issues they need to deal with. I thought the pattern was well established now. The time to update to 1709 is when 1803 has been out for a month or so. Therefore, the time to install 1803 would be a month after 1809 is released. That theory doesn’t hold water. Each new version seems to be more problematic than the last, with a growing list of issues that just persist and never seem to get fixed. Followed by a set of patches that just break more than they fix. Microsoft now is so far off track I don’t think even an act of god could sort them out. My laptop was on 1703/9 home, not sure which, and the wireless connection was set to metered. All happy, but no updates. With the change to defcon4 I thought it was time to remove the metered setting and see what I’d get. Several patches later all seemed OK, but then in the middle of using the machine the dreaded time to reboot screen popped up. Nag, nag, nag and no way to tell it to just [go away] until I was ready – and don’t go away for half an hour ’cause it will reboot whilst you’re not looking. Finished using the machine so hit the re-boot button and went out. Came back several hours later to a black screen with only a mouse cursor. All I could do was Ctrl Alt Del and reboot, Task Manager wouldn’t run. Fired it up in safe mode and still nothing would run. Fired it up in repair mode, nothing to repair. I now have 2 options, re-image – did a backup before the update – or let Windows re-install at start up. I chose the latter – I can always re-image later. Now I have 1803 running but a re-config ahead of me, several more hours methinks. FWIW, I hate the menu screen thing that you get when you click the flag, loads of rubbish I don’t want and apps updating pictures I’m not the least interested in, and no nice way to clean them out in one go. Not to mention getting rid of the telemetry again. If I were buying a new machine I’d go with a Chromebook, frankly, but that’s a different story entirely. Why don’t you just try Linux? Linux on a Chromebook is actually a fairly good idea, too. Then there are the “light” Windows systems that can’t actually run Windows properly, like that one thing my sister bought once… apparently about the only thing it runs sort of sensibly is GalliumOS (the Linux distro that’s focused on Chromebook hardware). I was rather suggesting trying Linux on a “normal” PC :). If the Chromebook has an Intel CPU (as mine does) you can dual-boot with any Linux distro. I’m using Fedora 28. If it’s an ARM Chromebook (much more common) you have to use Crouton. There Gallium is in fact your best bet. But all of this is getting off-topic for this thread. I’m taking care of about 310 client workstations, 250 are on Windows 10, the rest is still on Windows 7. We began migration tests with 1607, but the main Win10 rollout was with 1703. Fast forward another year I was asking myself the same question as Woody. Since this summer I did some tests with 1803 and haven’t encountered anything showstopping. Both fresh installations as well as in-place-upgrades were without major errors so far. This may be due to the fact that we mostly use standard “of the shelf” software and Dell hardware, which both didn’t give me much issues. 1. After an upgrade, that system partition may get a drive letter, which messes with our client backup software and may irritate the users. This is quickly fixed with diskpart, still I’ll have to care of that manually. I’m planning to do the upgrades in batches, so this manageable. 2. After an upgrade, the Windows Update service doesn’t send any reports back to the WSUS, until someone manually presses “Look for Updates”. At least that was my observation, it may do so by itself after a while, though. I have a 2 laptops and a desktop and have installed version 1809 (OS build 17763.55) on 1 laptop and the desktop PC. Did not lose any files at all. All my document, pictures, videos, downloads, etc were not affected. Both PC’s are running beautifully at this point since the upgrade in early October. I am waiting on the other laptop at this point. I know manny had problems but I did not. I had a blizzard of things to do this weekend, and decided yesterday to update my wife’s HP Envy laptop from Win10 1709 to Win10 1803. This machine is lightly used in the fall/winter time frame, so it had a bunch of stuff stacked up for updates. (She mainly stays on the HP desktop machine in fall/winter, which is already at 1803.) Used PKCano’s tip to clear the update queue except for the 1803 update and Windows Defender definitions – worked great (thanks again, PKCano!). I had a similar experience to Cee Arr, et al. in that the update process in total took approximately 4 hours. This includes downloading the update as well as installing and multiple restarts. Once that had been done, I checked some basic things such as printer access, etc. and everything was fine. Files all OK, can get to the printer over WiFi which was also working, etc. (I realize that it was 1809 that had the file deletion problem, but it doesn’t hurt to check.) Also updated FireFox, Chrome, and the iTunes client without issue. As I mentioned, this machine is lightly used, and my wife mainly uses her machines for Excel and playing Zynga games, so it probably isn’t getting exercised as much as others here, but for what it’s worth, I didn’t experience any problems with the update to Win10 1803. I’m waiting a bit longer for the jump to 1809. But four f******’ hours of course is totally ridiculous, never ran into any OS where upgrading was so painfully slow as in Windows 10. Especially a light user with virtually no software installed besides Office would be much quicker (and safer) off with a format C and new install. Which is even more nuts if you think about it. Something somewhere went awfully wrong down the line with this OS. Something somewhere went awfully wrong down the line with this OS. Something somewhere went awfully wrong down the line with this OS these OSs. Seriously, because of Microsoft’s too-frequent OS releases (semi-annual major rejiggerings called Feature Updates) and rapid re-releases (theoretically-monthly bug-fix updates, usually released two or three times per month), Windows 10 – Microsoft’s “last OS” – is in reality an apparently-unending rapidly-released stream of similar insufficiently-tested, insufficiently-stable, and thus potentially-problematic OSs. Just last month, the OS known as “Windows 10 Version 1809” was initially released, and then pulled several days later after some users who were upgraded by Microsoft found that their data files (documents, music, photos, videos, etc) were deleted during the upgrade! From May to October of this year, approximately 26 weeks, the OS known as “Windows 10 Version 1803” was re-released ~ 15 times, resulting in an average period between successive re-releases of ~ 1.7 weeks! Really?!? How does any of this help anyone??? And how much more time/effort/money must be wasted by Microsoft’s customers, businesses and consumers alike, before Microsoft decides to stop blindly pouring gasoline on the dumpster fire that Windows has become under it’s current release strategy? I just updated an Insider Preview in a VM. It’s still 1809 although the Build number is no longer 17763. It took over five hours before the reboot. Seems it kept “preparing,” “installing”, “preparing”, “installing” over and over. This is a test VM with some programs installed but not used (no user data). I just updated an Insider Preview in a VM. It’s still 1809 although the Build number is no longer 17763. Seems unlikely to be greater than 17763 if it’s 1809. Slow/Preview/Targeted are on 17763/1809 and Fast is on 18272/1903. My home machines went 1703 -> 1709 and have remained rock solid stable. I’m waiting the deferral period out there to eventually move them to 1803. At my new job everything is on 1803 and as far as I know there haven’t been any problems. If I were still on 1703 I’d probably go to 1803 at this point, as it seems pretty stable. I absolutely positively would not go to 1809 because it hasn’t had the extra 6+ months in the oven. @woody just FYI – my 1709 machines with feature update deferrals set to 120 days were offered the 1803 upgrade through Windows Update last night. So, if you go to 1709, set your deferrals for more than 120 days if you want to stay there. 1803 hit “Semi-Annual Channel” on July 10. Add 120 days to that and you get Nov. 7.
or an “education” edition of Win10 v1703, which also gets additional updates until October 2019, just like the enterprise edition. the education edition of Win10 is also quietly packaged in the multi-edition consumer ISOs & ESDs for Win10 version 1703 & later releases. By this patch Tuesday November 13th, whatever new updates for 1703 released then will only install on Education & Enterprise versions of 1703 and will refuse to install on Home & Professional editions of 1703. I am still on 1703 and will go on 1709 soon. My main focus is stability and security. I don’t feel like skipping a version. Do you think Microsoft and insiders test well going from one old version to a newer one than the one following it ? I don’t. Yes, I like the idea of gaining a few more months before having to switch again, but for me, it is not worth the risk. We are running a mix of 1709 and 1803 and a couple of unexpected 1809’s over 50 workstations. 1709 January update was a disaster for us in that it irreparably damaged the OS when combined with running legacy software that we MUST use. Later 1709 releases (and legacy software releases?) seemed to fix that problem and 1803 seems OK in that regard. So 1709 post-March 2018 or 1803 would be my suggestion for you. Do you think Microsoft and insiders test well going from one old version to a newer one than the one following it ? I don’t. Yes, I like the idea of gaining a few more months before having to switch again, but for me, it is not worth the risk. I just tested 1709 to 1809 in a VM and it not only went quickly – I do not see any indicators of problems. Next real test is to do a real machine designed for day to day usage. My plan is to migrate all my machines (10 right now) to 1809 as soon as we get the “all clear” from MS.
Based on earlier posts here, and Susan’s comments, I ran the upgrade from 1703 to 1803 today. I had a saved version of 1709, but I just decided I did not want to have to upgrade again in 6 months. The process went smoothly for me. So far, I have not seen any issues. One strange thing happened. I have Macrium Reflect set to backup my computer every evening at 7 pm. For some reason, Macrium was triggered to run a full backup right after the upgrade completed. Perhaps the upgrade erased the memory of last night’s backup, so it thought it needed to run the missed backup ASAP. I also got a message during the upgrade that Roboform had been updated and stopped, and it gave me an option to restart Roboform — which I did. Roboform is working, and the version is the same one I had before the upgrade. I may discover some other issues at some point, but this seems to have been a reasonable move. Go from 1703 to 1709. It’s the safe thing to do when you’re unsure of Microsoft’s stability. Sure, it means doing it again in six months, but maybe by then Microsoft will have learned the lesson of 1809 and we can jump to 1809, or even 1903. If Microsoft remains unstable, though, then 1803 it will be, and we can again hope. I’m on 1703, and will do whatever Woody does. But that’s my advice. I say 1803 should be the last version of Windows 10. We should be happy with that version of Windows and given proper updates for that version than being forced to have new versions like 1809. Why? There’s a ton of useful new things in 1809. Why would I want to go back to using Explorer without Dark Mode? My W10 Home & W10 Pro VM are staying on 1703. After the 1709 upgrades (repeatedly) failed, I blocked them from the Internet and they run flawlessly. I see no reason to risk letting MS break them (again). Reply To: On beyond Win10 version 1703 – Is 1803 ready yet? Really?